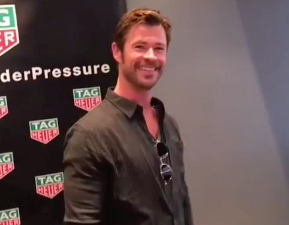 So Chris Hemsworth has recently been spending a lot of time with his family in Australia, growing an epic beard. But the actor has now gone back to work, and his beard has undergone an unexpected makeover. Take a moment and prepare yourself. 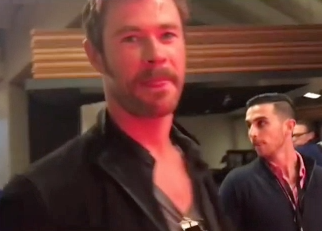 Yes, Chris Hemsworth has wittled his glorious beard down to a moustache and soul patch. Presumably it's for his role in Bad Times at the El Royale, which is set in the 1960s and features a cast of "shady characters". It definitely has that skeezy '60s vibe...and I gotta say, it's making me feel some type of way. Like, do I object to this kind of facial hair combination on every level – morally, physically, emotionally, spiritually, and other? Yes. Do I still find Chris Hemsworth extreeeeemely hot with this facial hair? Also yes. Do I find him even MORE attractive with this facial hair? I don't know, MAYBE. He is just as hot. An option for people who disagree with either of the above and are therefore wrong. Chris has shared the behind-the-scenes process of creating this look and frankly it's offensive how hot the whole thing is.